[Episcopal News Service] The Rt. 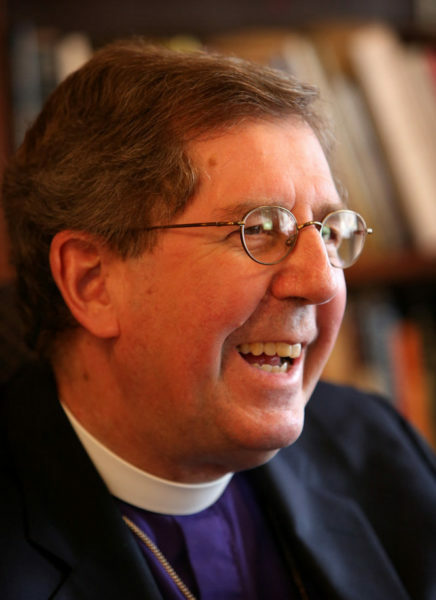 Rev.George Edward Councell, the 11th bishop of the Diocese of New Jersey, died May 21 hours after being transferred to hospice care, the diocese announced. He was 68. Councell served 10 years as bishop before retiring in 2013, five years after doctors diagnosed Parkinson’s disease. Councell died at about 6 p.m. May 21 at Robert Wood Johnson University Hospital in Hamilton. “Family and friends were with him. I had an opportunity to say prayers and anoint him, and said commendatory prayers with the family,” Bishop Chip Stokes said in a brief message to the diocese announcing Councell’s death. “Please pray for Ruth, their daughters Martha and Sarah, and hold the Councell family in your prayers. Councell, who received his Master of Divinity degree from Episcopal Divinity School in Cambridge, Massachusetts, was ordained as a priest in 1975 in the Diocese of Los Angeles and went on to serve as vicar of St. George’s Church in Riverside, California; canon to the ordinary of the Diocese of Western Massachusetts, and rector of Church of the Holy Spirit in Lake Forest Illinois, according an obituary by Planet Princeton. He also was a supporter of greater inclusion of gay Episcopalians in the life of the church. I met Bishop Councell when he was canon to the ordinary in the Diocese of Western Massachusetts. I enjoyed his regular column (“By George!”) in the diocesan newspaper. My prayers are with his family and friends. May he rest in peace and rise in glory. I have very fond memories of George during my first year of seminary at EDS (1974-5) as a senior who was warm, gracious and welcoming to all of us first year seminarians. Later as Canon to the Ordinary in the Diocese of Western Massachusetts he was exceedingly kind to my father who was a priest in that diocese. George was an easy person to love, respect and admire. Prayers for Bp. George and family. I met George when he served in the Diocese of Chicago and he was a good friend of my parish priest, Fr. Art Parker. George and Art were classmates at EDS. God’s peace and love. A wonderful man who will be greatly missed. Blessed to have known him. Prayers for all of his family.